Michael Molin Skelton listens to prayers in the wind and hears music, looks into the window “pains” of the heart and feels rhythm, touches the world through movement and knows spirit. He invites you to collaborate as we co-create this journey together. Michael reaches through dance rather than teaches to dance. He has been dancing since being pushed through the birth canal. After receiving a bachelor of fine arts degree from ucla he performed and choreographed in companies both nationally and internationally for 15 years. He met Gabrielle Roth early in 1994. Later that year, at the request of Gabrielle, he began teaching the 5rhythms. Michael got his 5rhythms certification in 1998 and teacher certification in soul motion in 2001. 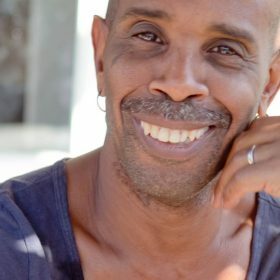 He has been a 16 year student of continuum montage with Susan Harper and his teaching of the 5rhythms and soul motion has been greatly influenced by her mentoring. He is a certified esalen massage practitioner since 1995 and is passionate about the art of touch. Michael met Anneli… and the world stopped. He is incurably and hopelessly in love and that constant smile on his face is the result of a heart that has been touched by an angel lightly draped in human skin. In October of 2011 they were blessed with the ultimate miracle; his name is jaylan kyan and he is the physical expression of their living love. michael hates talking about himself in the third person and hopes to see you in person somewhere within the dance. Gary Diggins ~ I grew up in a musical family and, from early childhood, was fascinated by how human beings communicate through word, sound, music, and even silence. For a period of time, I worked in the performing arts and opened for artists ranging from Alice Cooper to Sly Stone. Several decades later, I still perform as a musician and continue to maintain a private counseling practice, but my deeper story is really about facilitating group interactions. My integrated approach to group communication employs a technique called the Sonica Circle. It is designed to elicit collective wisdom and mindful listening within any configuration of people. Craig Kohland is a talented multi-percussionist, performer, DJ, music producer, retreat and ecstatic dance facilitator driven by the healing rhythm of the drum and the creative expression of the sacred.Since 1995, Shaman’s Dream, Craig’s multi-faceted music collective, has been at the forefront of the yoga and ecstatic dance music scene and has produced some of the key albums used in the yoga and dance industry. As a producer and the musical director of the “Shaman’s Dream World Groove Ensemble”, Craig along with Micheline Berry, has facilitated hundreds of ecstatic dance/ “live” world music concerts, plus countless live music for yoga classes and ritual retreats. OKA A celebration of all that it is to be alive and free in the world today, Australian based OKA draws upon their indigenous connection to place and country through music. Their signature sound is an irresistible blend of influences spanning house, big beat, reggae-dub, Roots, Jazz and world music. A rhythm based sonic tapestry crossing cultural boundaries, embracing the future without losing sight of the past. Vanessa Forbes – A firm believer of the healing power of music, Vanessa’s songs are uplifting, relaxing and inspiring. Mixing a combination of powerful Indian chants and her own original songs, feel stress melt away and your heart open as you experience her healing sound. For the past five years she has held a highly successful monthly music evening in Sydney called Absolute Soiree. Musicians from all corners of the globe have performed here to a constant full house.. During this time she has played with many different musicians and developed a strong following for her own music. Her debut CD “Love Letters from the Universe” was created in response to the many requests of the community around her to have her healing sounds in their homes. If Mother Earth could sing you a sweet song then this is how she would sound. Vanessa’s voice has the ability to lull you into a serene state of bliss….